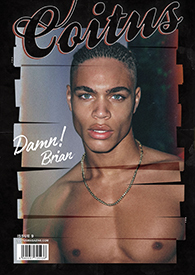 Coitus Magazine is back with it’s hottest issue to date. The 8th issue titled “Hard Copy” is a limited edition portfolio featuring 19 models by photographer Pantelis, capturing the beauty of youth at its most intimate. Oliver Bailey, Asher Flowers, Jack Padgett, Thomas Davenport, Gareth James Taylor, Allen Lovell, Giuseppe Rossi, Osh Mackenzie, Iasonas Laios, Maxim, Anthony A, Sami, Marck Torri, Paul Tockuss, Chris Mears, Sam Salter, Louis McMiller, Chris Jammer & Marlon Courbin.